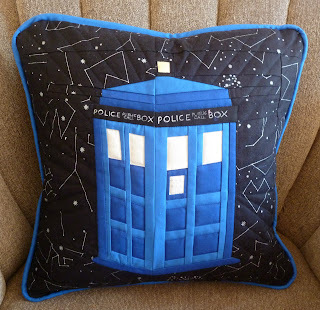 With the long holiday weekend I got to sneak in some sewing time and finish up this paper-pieced Tardis pillow. Caroline's advice to applique in the missing piece worked perfectly. My original plan was to embroider the text along the top but after writing it on with a white pen I was happy enough with the result to call it done. Apparently my inability to spot lint on my blocks until after I've photographed them continues... a better person would have reshot this but I wasn't in the mood;-) I loved the Lizzy House constellations print for the background on this but I wish I'd used something different to get more contrast. The black of the beacon disappears into the background. 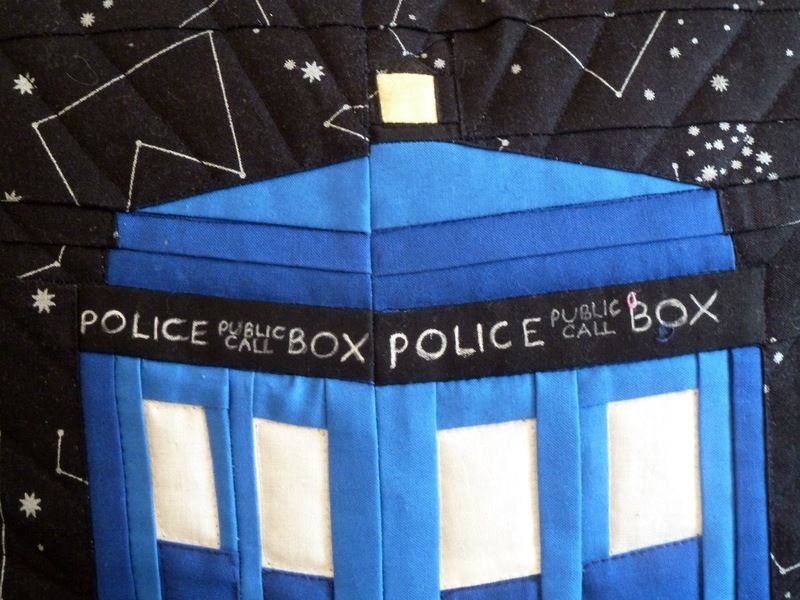 The outline quilting around the Tardis helps a bit but next time I'd do something different. I got the crazy idea in my head that I wanted to finish this with piping and a faux invisible zipper rather than my usual bound edge zipper back. It came out pretty well but it was a great reminder that I hate working with piping! I love this geometry print for the back. I'm thrilled to have my first holiday gift finished... have you started your holiday making? Spending time at this week's Finish it Up Friday by Crazy Mom Quilts. Finished pillow is 16" x 16"
Pattern: Tardis block by Trillium Design for the Doctor Who Along. 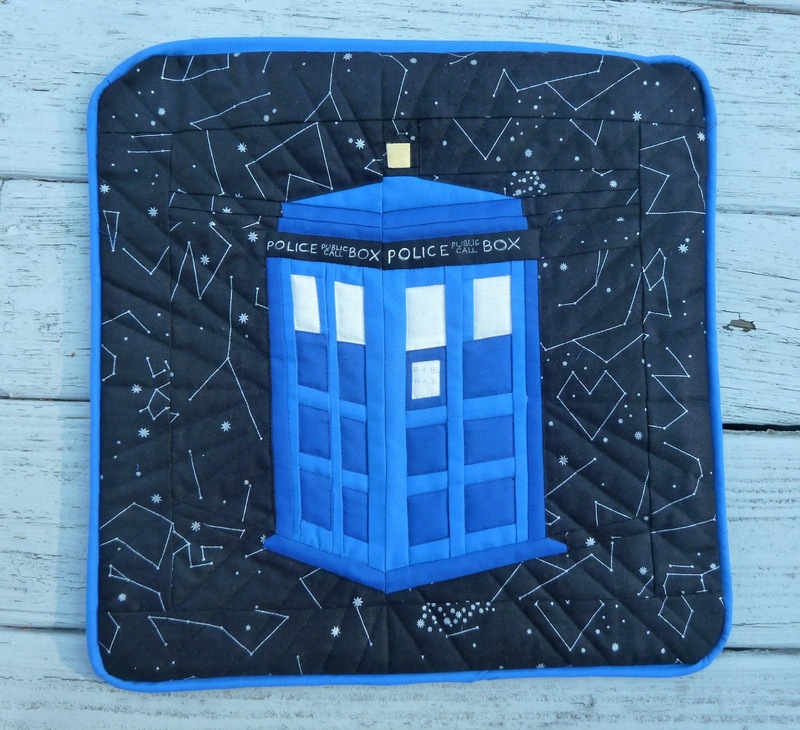 Fabrics: Fabrics: Kona Cottons from stash, Constellations by Lizzy House for Andover Fabrics. Thread: 50 wt. 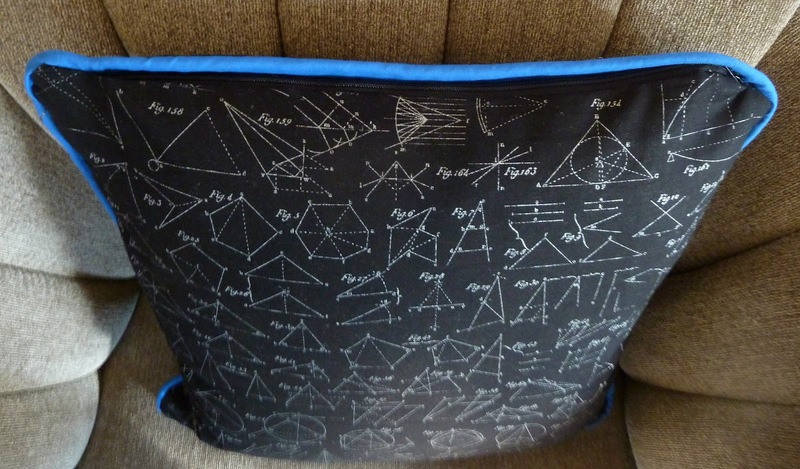 Aurifil in Black (2692). You're gifting this beauty? To me?! Wow! This came out great! Perfect background fabric! What a super gift! A Dr. Who fan will be thrilled!